In the age that we live in, working professionals need to get a large number of inevitable tasks accomplished within the limited set of working hours they have. Focusing only on one task could equate to lower productivity levels which most organizations regard as unacceptable. This means that every individual needs to execute more than one task at the same time or to say ‘Multitask’! Multitasking has its own set of pros and cons. However, it is also beneficial if done the correct way. 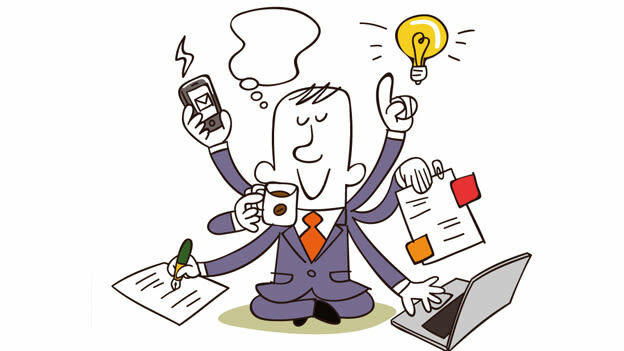 Let’s look at how you can multitask your way to success and achieve more through the day. Prepare a To-Do List: Every morning make a list of things that you need to complete that day. Preferably, start off by writing them down in a diary. Research shows that written goals are better than unwritten ones since they provide you with more clarity and also free up your mind helping you pull up your thinking to the things that you need to focus your attention on. Atleast, as far as work is concerned, maintain a diary religiously. If you don’t like recording things in a diary, you can even use mobile phone or online tools to keep a track of how you can better plan and organise your day. These days, you also have applications which help you keep a record of how productive you have been during the day. If you’re tech savvy, try using them to your advantage. Once you’ve prepared a hand written to-do list put it up in a place that is visible to you in the chaotic office environment. This way, you can stay on top of your work. Know which tasks need to be accomplished first and then complete them: Before you take on a task, know its importance and how it would affect your day if you took it up on priority. Prioritising your tasks will help you get the important and crucial activities out of your way first. This will then create time for the minor things which can be accomplished in a comparatively lesser time and would require lower levels of focus. When you take up an important task, make sure you tick that off your list (complete it in totality) and then move on to another task. Complete the work with single mindedness, preferably in tandem with your body clock cycle, so that you are at your mental and physical best when you are working on the task. The logic behind this is fairly simple. Important tasks need much of your concentration and focus and should be completed when you are fresh. Even if there is something urgent or pressing, keep it on the backburner and make sure you go back to it once you have completed the task on hand. To Stay on Schedule, Take a Break: Doing the same set of tasks for a prolonged time will cause fatigue and exhaustion and will soon create stress. Research shows that energy levels in a human body decline every 90 minutes. This cycle follows a pattern. This little fact highlights the point that you need to re-focus your attention to the task that you’re doing. It may be tempting to keep working particularly because you have a lot to be accomplished during the day. However, resist the urge to do so because this may pull down your performance and may impact activities that you have planned for. Remember, the way you spend your time during the break is more important than the time for which you take one. You may just take a coffee break or go for a walk and get some fresh air. However, while you do so, time your breaks. See to it that they are not prolonged. At times, you may feel that you’re wasting your time. But know this that small and regular breaks will help you replenish your energy reserves. Know how to Deal with Interruptions: Interruptions while you are at work are common. They could be in the form of telephone calls from a client or internal vendors, emails, messages on social networking sites or even time waster colleagues. Firstly, to manage interruptions, learn to say no to things that are unimportant or unnecessary. Emails from clients whose work is not as important as the task on hand, or a request to complete tasks when they can be handled by somebody else are common examples. Deal with time waster colleagues smartly. There might be colleagues who engage in small talk but they forget to keep it small. In such cases, encourage the interrupter to move straight to the point if a solution can’t be reached. Simple steps like these can be quite handy in enabling multitasking in the most efficient manner. It is not only crucial for leaders to be able to multitask well but also to do that in a smart, collaborative way.